We’d love your help. Let us know what’s wrong with this preview of Toxic Rainbows by Jim Lucio. Toxic Rainbows: Surviving and Thriving in the New Babylon by Jim Lucio is a lifemap and spiritual guide; a deprogramming and awareness manual that shines light on the dark corners of human experience and provides access routes back toward the light of change, happiness and creativity. 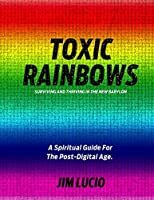 Written from a Generation X, pre-internet perspective, the author explores a subject that Toxic Rainbows: Surviving and Thriving in the New Babylon by Jim Lucio is a lifemap and spiritual guide; a deprogramming and awareness manual that shines light on the dark corners of human experience and provides access routes back toward the light of change, happiness and creativity. Written from a Generation X, pre-internet perspective, the author explores a subject that blurs the lines between psychology, philosophy and spirituality. His perceptive insights and natural approach to spirit creates a bridge for the reader to move from the mundane modern world to accessing the healing energies and limitless possibilities of the greater universe. The work outlines a process by which readers gain knowledge and deep insight by understanding the hidden true self. Through the discernment of patterns, habits, conditioning and the appropriation of ideas that no longer serve us, we are allowed to forge new paths that can lead to true miracles and the ability to harness love and the pure magic of nature. To ask other readers questions about Toxic Rainbows, please sign up.